Previous Post: First Feature Film Shot On The Canon 5D Mark II? Next Post: More Cast Announcements! That’s the question asked by many visitors to our website upon seeing the dolphins in our banner (others ask, “Why ice cream sandwiches?” but that’s another blog). It’s a fair question, especially since our official synopsis makes no mention, whatsoever, of any dolphins in the script. To be honest, this omission was strategic. I mean, what’s the last movie with dolphins you took seriously? FLIPPER? DAY OF THE DOLPHIN? The pilot for SEQUEST DSV? Dolphins have had little success in dramatic screen roles, the notable exception being Keiko (aka “Willy”) the Orca, whose stirring screen performance in FREE WILLY moved us to free him and who shortly thereafter died, no doubt, due in large part to his inability to cope with his human-guilt driven reintroduction to the nordic wilds. So the net success rate for dolphins in motion pictures remains pretty low. Nevertheless, yes, our movie has dolphins, and they play an intrinsic thematic role in the story that unfolds. Modern approaches to the dolphin have been no less shaped by our desire to commune with something alien to ourselves. In her novel, A RING OF ENDLESS LIGHT, author Madeleine L’Engel explores a young girl’s sexual awakening and acceptance of death through her telepathic connection with dolphins, and in the 1960s, counterculture psychoanalyst and mystic John C. Lilly became convinced that the next level of human awareness would be precipitated by successful communication with dolphins. Still. Why dolphins? Why in this movie? 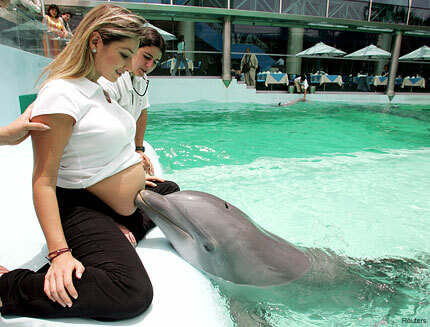 In A BEAUTIFUL BELLY, a young pregnant woman (Danny) becomes fascinated with the idea of dolphin therapy, a real maternity practice celebrated in Peru (and pictured above). Her interest in this idea — that a dolphin might somehow understand human pregnancy better than some humans — drives her journey from start to finish. Salvation. Rebirth. Safe journey. 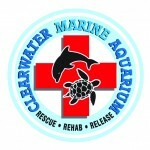 Gaining access to dolphin talent has been no easy task for our production, but the good people at the Clearwater Marine Aquarium, a marine rescue and rehabilitation facility, have been kind enough to work with us to get the dolphin footage we need. We’re thrilled to be partnering with such a great organization to bring our story to life, and we hope you’ll take a look at their site to see how you can help support their important environmental work. So there you have it. Dolphins in A BEAUTIFUL BELLY, and now you know why. One dolphin movie I really liked– The Hitchhiker’s Guide to the Galaxy.